Another October is upon us and that means it’s time for another 31 Days of Horror. 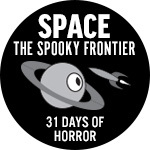 From the many Earthly invasions to the old just traveling in the vast emptiness of the galaxy and finding unspeakable horror at every turn this year’s horror theme is Space: The Spooky Frontier. I will be covering everything from classics of the genre to some good ol’ B-movies and a few you never ever heard of. To start things off is the 1964 British horror, The Earth Dies Screaming. Several people are dropping dead all over the place. Train conductors, people driving cars, people walking in the streets. They all fall over dead. A man drives into a small town. Jeff Nolan (Willard Parker) gets out and looks at the death everywhere. He walks into a store and grabs a radio. He walks outside and notices a dead couple in a crashed car. He proceeds into a hotel where he finds the desk clerk dead. He moves the body and then pours himself a drink. Jeff turns on the TV getting nothing but static and weird signal. He then turns on the radio finding only the same thing. He’s interrupted by a man with a gun called Taggert (Dennis Price) and a woman named Peggy (Virginia Field). Everybody introduces themselves and soon everybody is friends. Suspicious friends. Taggert doesn’t seem to be what he’s claiming. The next day Jeff walks out into the street. He notices the dead couple are missing. He finds them alive and in a grocery store, a man and wife named Edgar (Thorley Walters) and Violet (Vanda Godsell). Jeff takes them to meet Taggert and Peggy. Jeff discovers that all the survivors were protected from the air when the attack happened. Jeff was flying a plane in the upper atmosphere, Peggy at a hospital on oxygen and Edgar and Violet were at a lab with controlled air. Taggert refuses to share where he was. They all decide that the country was gassed but don’t know who. Violet notices two men in containment suits and runs out after them. The two men are revealed to be alien, almost robots. One touches Violet and kills her. Jeff and Taggert shoot at them but they seem to be bullet proof. The two creatures leave and then a young couple named Mel and Lorna (David Spenser and Anna Palk) arrive in a car and get filled in on what’s going on. To make things even more fun Lorna is pregnant. Jeff decides that everyone needs to stick together if they are going to survive. That night the group gets another shock. The dead start walking around. Director Terence Fisher was one of Hammer Films top directors. Fisher helped the studio achieve fame with such classics as The Curse of Frankenstein and Horror of Dracula but by the early 1960’s Fisher making a few films for different studios before returning to Hammer and this was one of his better efforts. The film is quite intense, at least until the robots show up (they look a little silly). Still a cool little low key sci-fi/horror.